Burning ISO image to CD/DVD disc won't bother you anymore once you own 4Media ISO Burner. 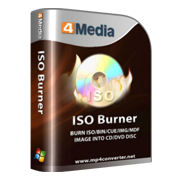 With this ISO burn software, you can not only burn ISO to CD/burn ISO to Home DVD disc, but also burn CD/DVD from other image files like BIN/CUE, IMG, MDF, NRG, CDI, B5i, B6i, DMG, etc. effortlessly. This ISO burning software supports burning image file on nearly all CD/DVD disc formats including CD-R, CD-RW, DVD-R, DVD+R, DVD+R DL, DVD-RW and DVD+RW. To guarantee the accuracy and usability of the burned CD/DVD disc, the ISO Home DVD burner/CD burner helps you verify the written data in the way of comparing burned data with original data after burning. To burn ISO image file to CD/DVD disc, this ISO DVD burner/ISO CD burner software is definitely your best choice. Besides burning ISO image, 4Media ISO Burner also supports burning CD/DVD from dozens of image files like ISO, BIN/CUE, IMG, MDF, NRG, CDI, B5i, B6i, DMG, etc. No matter the source is data ISO, media ISO, or bootable ISO image files, you can burn them on CD-R, CD-RW, DVD-R, DVD+R, DVD+R DL, DVD-RW and DVD+RW. Once you insert rewritable disc with data, the ISO burning software will detect it automatically and help you erase disc data if you want. For guaranteeing the correctness and usability of written disc data, this ISO burner will compare the written data with original data for verification when ISO burning done, and a data verification report will show you the incorrect & lost information if ISO burn failed. The ISO burning speed and number of copies can be adjusted freely according to your own requirement in this ISO burn software. The ISO to CD/ISO to DVD burner will check for updates automatically to assure you of the latest version and better ISO burning experience. You can check the detailed information of ISO burn from the burning process bar: percentage completed, elapsed time, remaining time, and so on. With just a few clicks, the whole ISO to CD, ISO to DVD burning process can be accomplished easily. Provide several after burning done actions to save your time and trouble when burn ISO to CD, burn ISO to DVD. The ISO burner offers you many interface languages: English, Japanese, German and Chinese. Prompt for errors in CUE file, correct corresponding BIN/FLAC/APE/WAV file names specified in CUE file automatically. 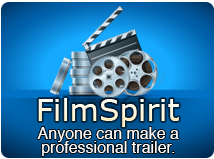 How to burn ISO or other image files to CD/DVD discs?